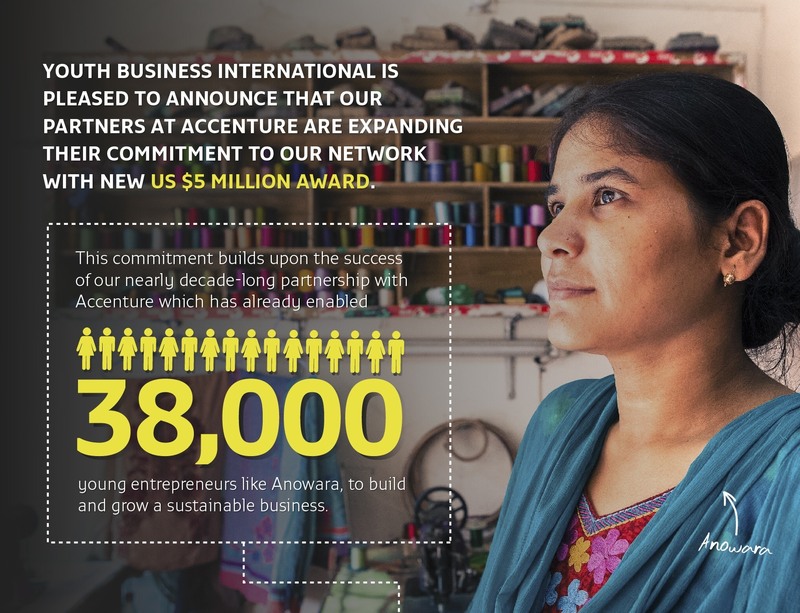 Youth Business International is pleased to announce that our partners at Accenture are expanding their commitment to our network with a new US$5 million award. This funding will empower YBI to equip 50,000 young people with the skills and support they need to start and grow a business. In addition, Accenture funding will enable YBI entrepreneurs around the world to establish or grow approximately 10,000 start-ups and create an estimated 16,000 jobs. Extending over three years, this award is also an investment in the capacity, scale and impact of the global YBI network. Accenture’s support and expertise will catalyse investment in our global technology infrastructure and the tools used by our to members share knowledge and replicate effective responses to youth unemployment. The funding will also enable YBI to expand into new territories of high demand and increase network membership from 40 to 65 countries. This is the third Accenture grant to YBI, reflecting our shared commitment to meeting the challenge of youth unemployment. Each Accenture grant has focused on strengthening a different part of the YBI network, and the longevity of the relationship reflects our shared commitment to challenging the ongoing youth unemployment epidemic. Our recent Most Significant Change report highlights the impact on YBI members of the last round of Accenture funded Capacity Development. The YBI network is a unique global laboratory in which we can test innovative new approaches to meeting the youth unemployment challenge, in a of range economic and cultural contexts. Accordingly, part of this round of Accenture funding will be used to fund 200 Capacity Development projects, and innovation focused responses to youth unemployment, that will eventually be scalable throughout our network and beyond. In addition the grant will engage Accenture local offices around the world with the work of YBI members, providing a valuable opportunity for staff to support YBI activity in their local communities. This grant is an important part of Accenture's Skills to Succeed programme, which is equipping more than 3 million people around the world with the skills to get a job or build a business. We are delighted that Accenture sees such value in our partnership and has elected to deepen our relationship. This award will bring life changing support to thousands of young entrepreneurs and strengthen the YBI network in a number of ways. Watch out for updates here and on our social networks for more information on the first round of our Accenture funded Capacity Development projects and the other elements of this exciting partnership as it develops.